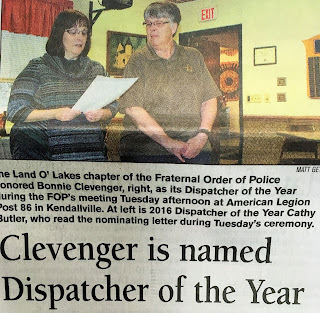 911 Dispatcher of the year ... hey, I know her! In 1981, California declared the first Public Safety Telecommunications Week, so you can't say nothing good ever comes out of California. 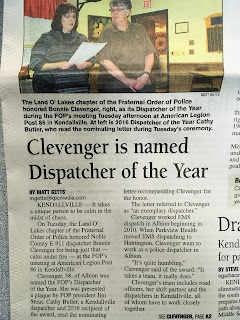 Around here we call ourselves dispatchers, or sometimes 911 dispatchers if we've feeling particularly unappreciated, which does happen from time to time. 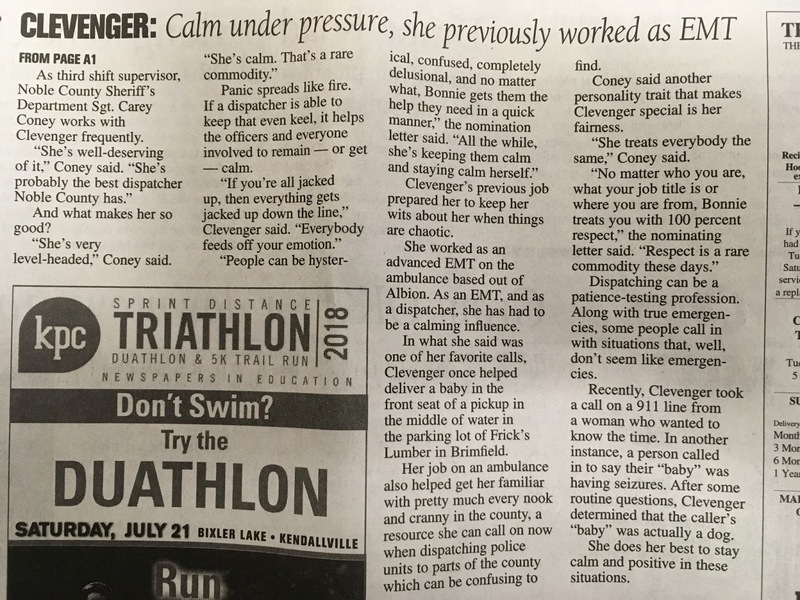 In a fifteen minute period last night we took 911 calls of a prowler tapping on windows, domestic violence in progress, and a baby not breathing, so personally I feel some appreciation is in order. Hearing my feelings, Indiana Governor Eric J. Holcomb proclaimed April 8-14 Public Safety Telecommunications Week here in the Hoosier State, as has been happening since 1999. 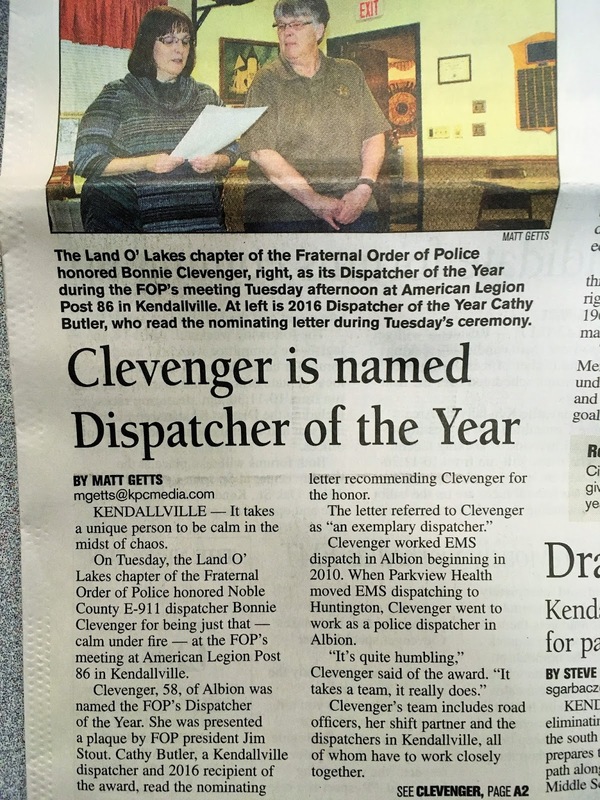 Saying "dispatchers" doesn't really cover it, especially in small dispatch centers. On third shift I work with a grand total of one partner at a time. We take 911 and business line calls, send out police and fire trucks, transfer and monitor EMS calls, and handle some calls ourselves without having to contact anyone else. We run license plates and driver's licenses, handle warrant searches and services, put out weather alerts, contact highway departments for road problems and utility departments for electrical or gas emergencies, keep track of flooded and closed roads, and track down the origin points for the hundredth 911 hangup call of the night. We talk to the drunk, the disturbed, and angry, the pranksters, and the people having the worst days of their lives. We guide people through what they need to do to survive until help can arrive. We are, sometimes, the last voice someone ever hears. And some of us do it while staying up all night. By the way, some government agencies classify us as clerical workers. Boy, that looks a lot like my shift partner there on the right. Hey ... that IS my shift partner! 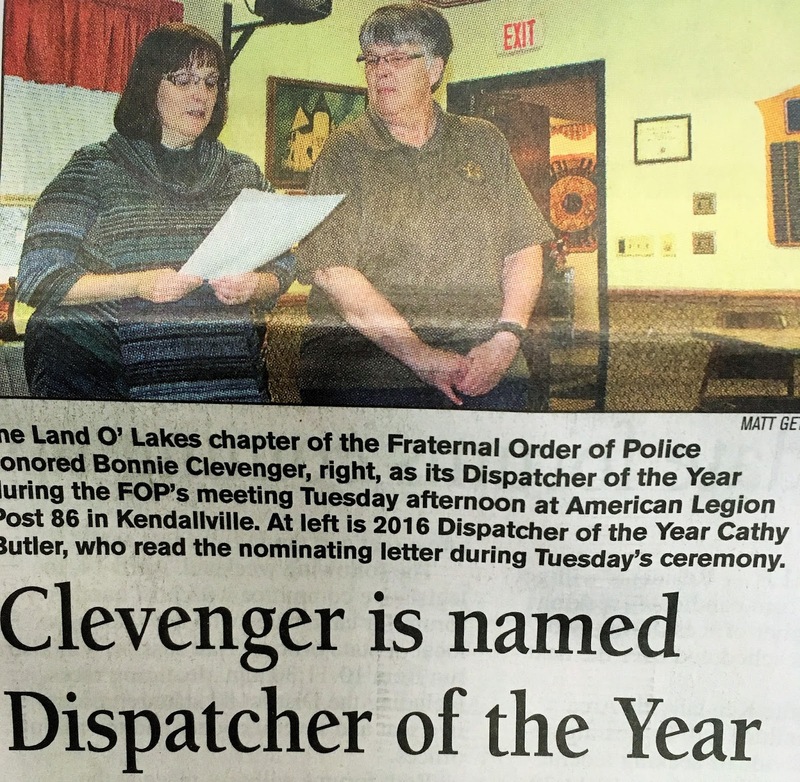 Congratulations to Bonnie Clevenger on well deserved recognition! I can only imagine riches will follow, and I'm hoping she'll shed some small portion of them on the rest of us. Now remember, if you have to call 911: There's a human being on the other end of the phone.